What's happening between those mountains? A rocket is being launched to space. 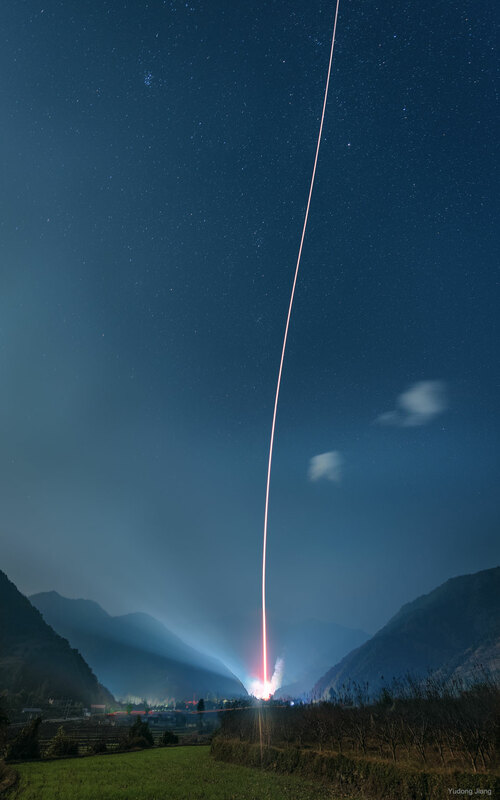 Specifically, a Long March 3B Carrier Rocket was launched from Xichang Satellite Launch Center in Sichuan Province in China about two week ago. The rocket lifted two navigation satellites to about 2,000 kilometers above the Earth's surface, well above the orbit of the International Space Station, but well below the orbit of geostationary satellites. China's Chang'e 3 mission that landed the robotic Yutu rover on the Moon was launched from Xichang in 2013. The featured image was taken about 10 kilometers from the launch site and is actually a composite of nine exposures, including a separate background image.